Souami-ryu Ikebana is a time-honored style of prestigious Japanese flower arrangement which was founded by Shinsou Souami during the Muromachi era more than 500 years ago. Shinsou Souami was one of the several Doboshu, a technical arts advisor for the 8th Shogun Ashikaga Yoshimasa. He was prominent in all fields of arts, including india ink painting, incense appreciation and landscape gardening. Shinsou Souami was considered one of the key persons of Muromachi culture. Some examples of his work still remain today, such as a fusama-e (painting on a papered sliding door used as a room partition) in Daitoku-ji and Daisen-in temples in Kyoto and a stone garden at Ryuan-ji temple. Collections of his Suibokuga (India ink paintings) are owned by the Boston Museum and the Metropolitan Museum of Art in the United States. Since being formed by Shinsou Souami, the stronghold of Souami-ryu was based in Touji-in temple in Kyoto for some time. Following him, Souami-ryu was led by Otsu and then was later succeeded by the chief priest of Zendou-ji temple in Nagoya. Finally, Souami-ryu was re-settled in Tokyo by the 17th Headmaster, Sofu Kongetsuan, in the middle of the Meiji era. In recent years, Soami-ryu Ikebana has dedicated flowers at the Emperor’s Palace. The 18th Headmaster, Soutei Yokochi, was invited to arrange flowers at the enthronement of Emperor Hirohito. The 19th Headmaster, Soushoen Yokochi was requested to decorate the Togu Palace with an arrangement for the marriage ceremony of the Crown Prince Akihito (the present Emperor). The 20th Headmaster, Wakoh Yokochi, has received an Ikebana Award of Merit from Her Imperial Highness Princess Hitachi. 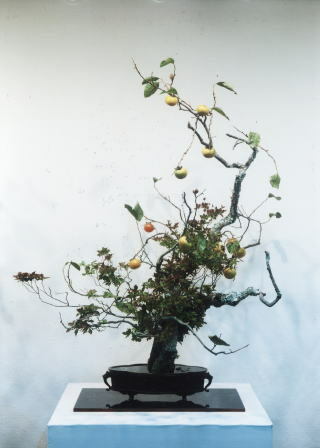 The main feature of Souami-ryu Ikebana is aiming to improve people’s spirit through creating an arrangement and therefore becoming one in spirit with the arrangement. The traditional precept of Souami says, “Flower arrangement is not to arrange the flowers, but to arrange the spirit. Firstly, observe decorum”. Souami-ryu Ikebana puts emphasis on the desire to carry through faithfully with the foundation of classic Souami spirit and form and not lose its essence to the present climate. Presently, a modern form of arrangement based on a contemporary perception of art and space, created by the 19th Headmaster, Soushouen Yokochi, is included in Souami –ryu Ikebana. The practice of Souami-ryu Ikebana includes both classic and modern forms. Copyright©2011 Souami All rights reserved.